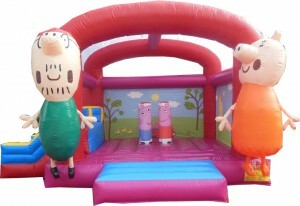 The Peppa Pig Jumping Castle and Slide will be centerstage of your party, as your precious cherub bounces with Peppa the loveable, cheeky little piggy. It measures 5m long, 4m wide and 4m tall. It is a covered castle, protecting your children from both sun and rain. The slide will provide entertainment for hours with endless circles as the little piggies chase each other around and around. The $210 hire fee includes a full day hire. This provides entertainment for the kids while you set up and pack up your event. At Wonderland Jumping Castles we pride ourselves in clean Jumping Castles to ensure everyone enjoys their Wonderland experience. However, we do ask that you do not eat or drink within the castle. Other items which damage or dirty our castles are shoes, streamers and balloons. We are a small family business and completely understand that sometimes plans change. There is no cancellation fee at Wonderland Jumping Castles. We even understand that you can’t control the weather. If it is forecast to rain on the day of your event, we will contact you and discuss your options. If you do not take delivery of the castle, you will not be charged. Do you have more questions? Check out our Frequently Asked Questions or send us an email, better yet give us a call 04 JUMP JUMP. Wondering how it all works? Grab a cuppa and look at our Terms and Conditions. Wonderland Jumping Castles © 2018 All rights reserved. Terms and Conditions.